I’m overwhelmed by the loud, rhythmic sounds of people chanting and drumming. Hundreds of people swirl around in multi-colored batik sarongs and skirts. Bright sunshine … suffocating heat and humidity … a sweet perfumed smell of flowers and incense wafting across the potholed asphalt … all of this gives me sensory overload. Standing on the brown dirt path at the roadside, I’m stunned and bewildered as I look out at this melee of activity. Feeling very self-conscious about intruding on such a personal scene, I look around to see only a handful of tourists hovering on the periphery. A short old man, wizened by the sun, smiles and beckons me into a nearby open hut, where he places a folded brown cotton band around my head and a bright red and green batik sari around my waist. “Welcome to our cremation ceremony,” he says as he leads me back out into the sweaty throng of Balinese villagers who are preparing for the procession. 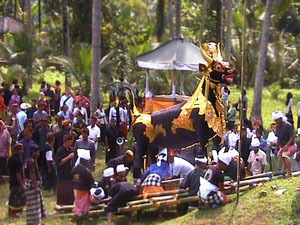 A body wrapped in a white shroud is brought out of the village leader’s wooden slatted house, carried shoulder high along a dirt pathway and placed in a black coffin. White flower petals thrown by mourners descend on the coffin as it is borne to a 30-foot-high pagoda-like tower standing nearby on the road. The coffin rises up to the tower, passed carefully from hand to hand by the young men of the village. It ascends in stages, level by level, as some of the wiry and muscular men climb past it to the next level to receive it again. Eventually it is placed into a dark recess halfway up the glittering red and gold decorated tower. The mourning family looks solemn, but occasionally they smile and wave to their friends. It’s not the typical weeping, grief-stricken scene you see at a western funeral. They walk in front of the tower as it’s slowly pushed and pulled along the hot, dusty road by over a dozen strong young men. We head through the small, ramshackle village, down the slight grade towards the cremation grounds a half-mile away. Resting on four enormous black rubber tires, each the size of a man, the tower is so tall that it was necessary to remove the overhead power lines. Hundreds of people follow, some silent, some talking, and some singing. I join the throng, slowly walking along with the crowd. Balinese Hindu Cremation ceremonies are among the most renowned cultural activities in the world for adhering to their ancient roots, dating back over a thousand years. One notable exception has broken with ancient tradition … the wives of the deceased no longer throw themselves onto the blazing funeral pyre as their dead husbands are cremated. The ceremonies are quite rare, held only when a village leader dies, and are the focus of tremendous activity by the villagers for weeks beforehand. The tower must be built with ornate and colorful decorations to adorn it. 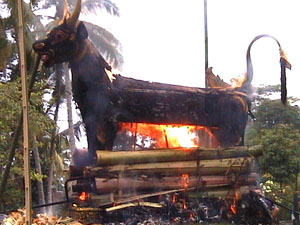 A huge, fierce-looking black bull or water buffalo in which the coffin is ultimately deposited for cremation has to be created by a specialized craftsman. 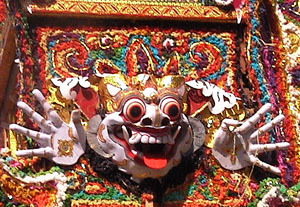 The families of the deceased will often spend their life savings on the ceremony fixtures, as Balinese culture considers it disgraceful not to do it right. After all, the deceased is going on to a far better place and it is the responsibility of the family to ensure this happens with utmost comfort, ceremony, and respect. The tower grinds to a halt and the coffin is transferred respectfully into the large matching hole in the back of a seven-foot-tall fierce-looking black and gold painted bull. After brief speeches and following chants, what looks like a cross between a hot air balloon air heater and a World War Two flame-thrower is fired up and aimed at the bull. A 12-foot jet of red and yellow flame spurts out. “It get up to 2,000 degrees,” a Balinese man tells me, as we stand back from the rapidly expanding heat wave, watching the palm logs catch fire. The crowd stands motionless, mesmerized, watching as the flame turns blue with the heat and the bull starts to blister and burn. Families spread out among the final resting places of their beloved ones, cleaning up around the simple graves. They spread out brightly-colored blankets and straw mats, unpacking food and drink. They place small woven baskets of flowers as offerings on the gravesites of their deceased, and then pray to them. That done, they sit around laughing, talking, and eating their food, while the children run around, chasing and hiding from each other. Balinese cremations are not a sad event, but rather a remembrance of friends and family who are no longer with them. There is even joy that they are in a better place. Hours later, as the shadows grow long and dark, the villagers slowly start to disappear, leaving a few people watching the red hot ashes—all that is left of the bull and the body. I’m told that a small group of men will later chop what remains of the body into tiny pieces so the body will be completely incinerated into ashes. Hypnotized and emotionally drained from processing the fantastic things I’ve seen, I finally look up from the ashes to realize that staying longer might be imposing on this final ritual. I slowly wander back to the village to find a cab. I keep looking over my shoulder at a sight I know I will never see again and certainly will never forget. The slowly dispersing people, the plume of smoke, and the red glowing ashes are my last receding vision of this memorable event.